I have not posted for a while but I have been busy painting. 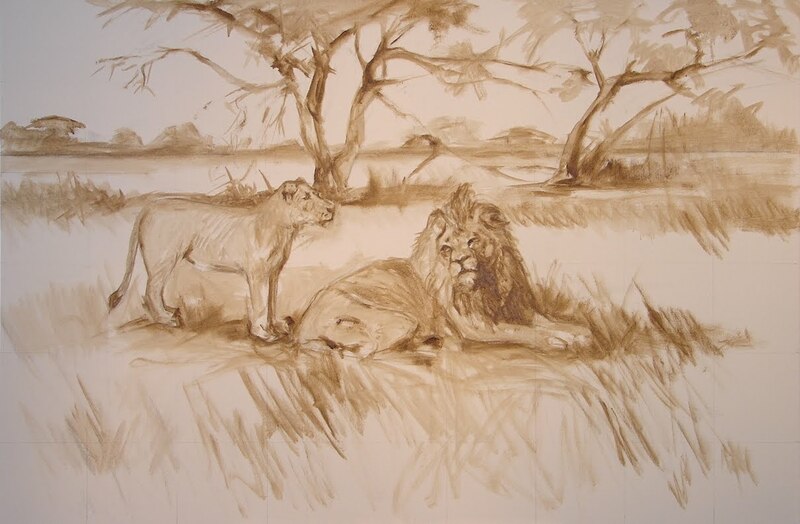 Here is the start of my latest African wildlife painting. I’m using photos that I took last week for the main characters, yes we have lions at the Springfield Dickerson Park Zoo, and if you have all day they will eventually pose for you. Using Photo-Paint (the Corel version of Photo Shop) I combined 3 images to compose this scene. I used it for reference and sketched it onto the canvas then using Raw Umber thinned I painted the under painting. The canvas size is 24" x 36"